Call them the Little Comets that Could. Eastern, a small Class 2A school in most sports, battled the big teams at the single-class IHSAA Girls Track and Field state finals and walked away with a pair of individual state titles, a relay state title and a fourth place finish as a team – trailing only Fort Wayne Northrop, Lawrence Central and Bellmont. And in the process, they won the respect of the entire state track and field community by not just winning titles, but posting blistering times. The squad was led by the two best female all-around student-athletes in the history of Howard County – twins Brittany and Bethany Neeley. Already well-known for their running heroics, the duo each won an individual state title and teamed with fellow senior Sarah Wagner and freshman Jessica Sprinkles to not only win the 3,200 meter relay, but shatter the previous record by more than 10 seconds. 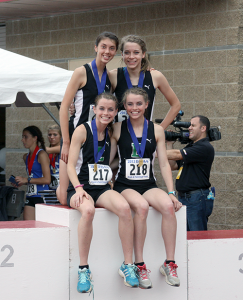 The foursome’s time of 8:53.74 was the eighth fastest 3,200 girls relay ever run in a United States high school event – a slim 5.45 seconds off the national record set by Grosse Pointe South H.S. (Mich.) last year. Bethany defended her state title in the 1,600 meter run with a time of 4:53.37 and was a member of the fifth place 1,600 meter relay team with Brittany, Sprinkles and Avery Ewing. Other Eastern participants included a 12th place finish in the high jump for Wagner (5-4) and a 27th place finish for Sprinkles in the 800 meter run (2:29.43). In addition, Bethany Neeley won the prestigious IHSAA Mental Attitude Award for Girls Track and Field. Yes, it was a magical spring for the girls track and field program, and for that, they are the 2013 Sports Journal Story of the Year.